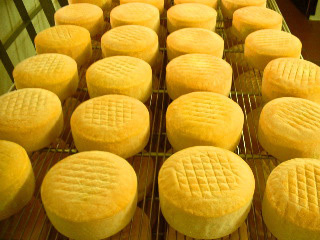 In honor of St. Patrick's Day, this week's Cheese of the Week is Gubbeen, a washed-rind cheese made from cow's milk in West Cork, Ireland. The name Gubbeen is from the Gaelic word "gobin" which means "small mouthful," and refers to the bay near where the cheese is made. The dense, savory taste of the cheese is at least partly attributable to the quality of the grass that grows in the warm and humid Gulf Stream climate in West Cork. This cheese uses vegetable rennet and is suitable for vegetarians.